Bo Burnham has never directed or written a movie before, has never directed or written at all before, unless you count his own comedy specials and a couple TV episodes that nobody saw. He’s a complete amateur when it comes to feature films, and this is going to sound tired by the time the year is out, but it’s beyond impressive that he was able to create Eighth Grade on his first try. It just goes to show how well honest emotion shines through when you’ve got something personal to say, how special a story can be when there’s almost nothing to it other than the truth. Burnham might not be a middle school girl, but you can tell that the main character in his movie comes from experiencing something similar; haven’t we all? Growing pains are not unique, we all feel them, and that’s why coming-of-age plots are so relatable, this one hitting closer to the bullseye than most, which is why it is absolutely one of the very best films of the year. Kayla is graduating 8th grade soon, and high school looms ahead like an unscalable mountain of icy cool. She’s never been good at making friends, at showing people the fun girl who hides deep behind a shy exterior. Kids at school think she’s the quietest girl to ever walk the halls, but to herself Kayla is nothing if not talkative, she simply doesn’t have anyone to talk to. So she makes YouTube videos about how to navigate the world, something she can’t do herself, and no one is watching anyway, so it doesn’t really matter. She tries to chat up the popular girls, tries to be noticed by the popular boys, but nothing works, and 9th grade is just one summer away. The only child of a single dad, Kayla knows she’s loved, but what she wants more than anything is the approval of those her age, and she’s sick of that wish never coming true. Growing up in the digital age isn’t easy, it’s hard not to compare your own life to all those you see online, and navigating social waters is a messy business; welcome to the wreckage of the American teen. Burnham gets it all right, hits every nail on the head, which is why Eighth Grade works so beautifully. We who did not grow up with smart phones can see how they impact every day life for a teenager, can understand more fully the pressure to be perfect beyond anything even remotely attainable. We see from a young girl’s perspective, how desperately she needs to be included, how much she longs to be a part of the over-hyped teenage experience. How Burnham knew how to show us all this and all so perfectly is beyond me, but he channels an everyman into Kayla so that we can all see ourselves growing up, see our own hard times reflected in hers. He knows when to get serious, get sexual, and get silly, which produces some moments that will make audiences uncomfortable, but only because they are so hilariously true, or sometimes so unfortunately accurate. 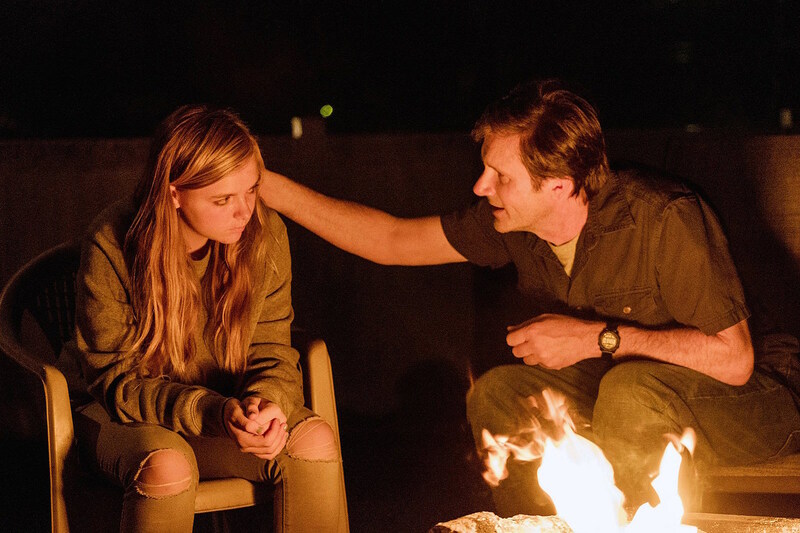 There’s a scene around a fire where Kayla and her dad talk things out, and it’s so brilliantly real, so open and honest, that it will bring you to tears, and it serves as an example as to why the film worked and as to how strong its pieces really are. Fisher is a revelation as Kayla, the perfect vehicle for us to navigate through the story in, and I hope we see so much more from this rising star. Her performance was incredible, I can’t imagine any one else in the role, and she’s a major factor in the film succeeding. Hamilton as her father was great as well, a sensitive man who was trying his best, who took time when it was needed to simply tell his daughter that he loved her, to let her know that he was proud. The story was heart-breaking and heart-warming in turn, especially the father/daughter scenes, which I felt on a very personal level and walked away from replaying in my mind. The movie just soars, truly soars, above anything we could have imagined or predicted. Eighth Grade is definitely one of the very best I’ve seen this year, and it’s hard to imagine the Oscar-centered features that we’ll see later in the season overpowering this smaller one when it comes to pure emotion and raw relatability.